After a couple of light showers, we watched as the seeds began to sprout. 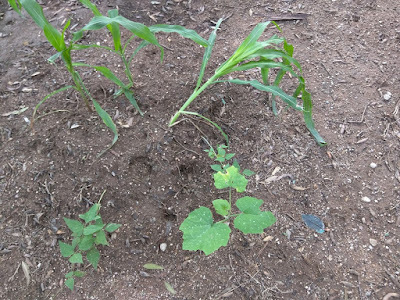 (Though some mysterious varmint was eating the leaves off of the tops of the beans and only a couple of squash leaves unfurled.) A volunteer squash in our compost pit was doing better. Unfortunately, there wasn't much of a monsoon this summer, so we watched disheartened as our garden withered away. 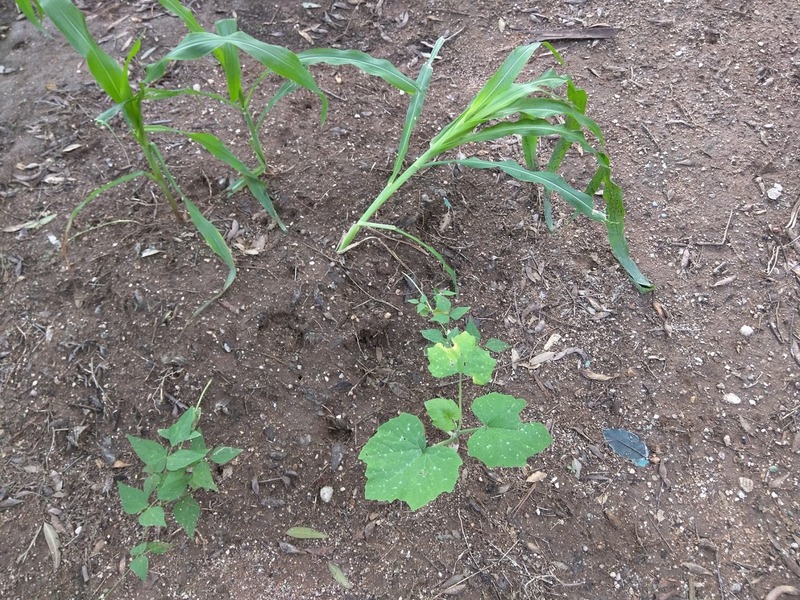 On one of the mounds, a single bean plant survived, and there were two wilted corn stalks still clinging to life on another. So I dug three holes next to the bean plant, put some compost at the bottom, and replanted the corn and the volunteer squash. Storm clouds came and went as we waited... and waited... and waited for rain. 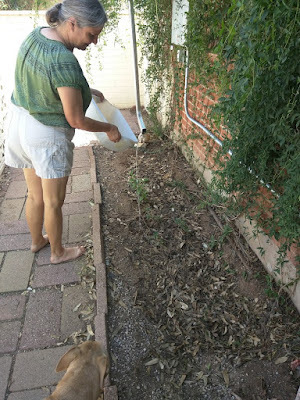 As I watched the effect of the drought on our garden, I became more conscious of how much water we use in our home. We started saving dishwater for our thirsty hummingbird trumpets. We bought what we thought was environmentally friendly dish soap. 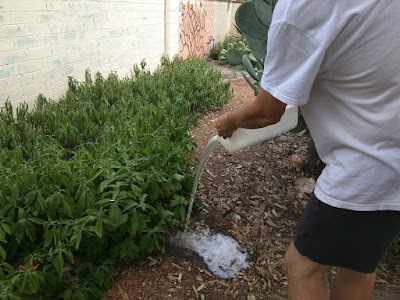 But it turned out to contain more salt than we would have liked, so we have to alternate between the soapy dishwater and the clear rinse water to help flush the salt build-up out of the soil. The downspout we installed was useless without rain. So we began to use the water from rinsing off our produce to water a little kitchen garden where I had planted some potatoes that sprouted. We also watered the remaining 3 Sisters mound. (You don't want to use water with meat particles in food gardens because it could transmit pathogens.) The bean plant is still hanging in there, and the potato plants are growing nicely all from water that would have gone down the drain. I know, I know, it would be so easy to just turn on the hose. But this is just a drop in the dish bucket compared to how many Hopi and Navajo have to conserve water. While we are "experimenting" with saving water, members of 280 Native American tribes have gathered together at Standing Rock, South Dakota to fight for water! 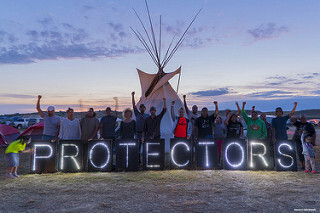 They have put their bodies on the front line to stop the construction of the crude oil pipeline that will go under the Missouri River - the main source of water for the tribe and 17 million other Americans. A federal judge recently rejected the Standing Rock Sioux Tribe's petition to stop construction of the Dakota Access Pipeline. But later that day, the US Army, Justice, and Interior departments jointly announced they would temporarily stop the pipeline work until the environmental impact is investigated. The pipeline continues to be built in other areas. Dan and I celebrated that victory with a symbolic dinner of the 3 Sisters. To me it represented the strength these courageous protectors have shown by working in unity. Corn, beans, zucchini. 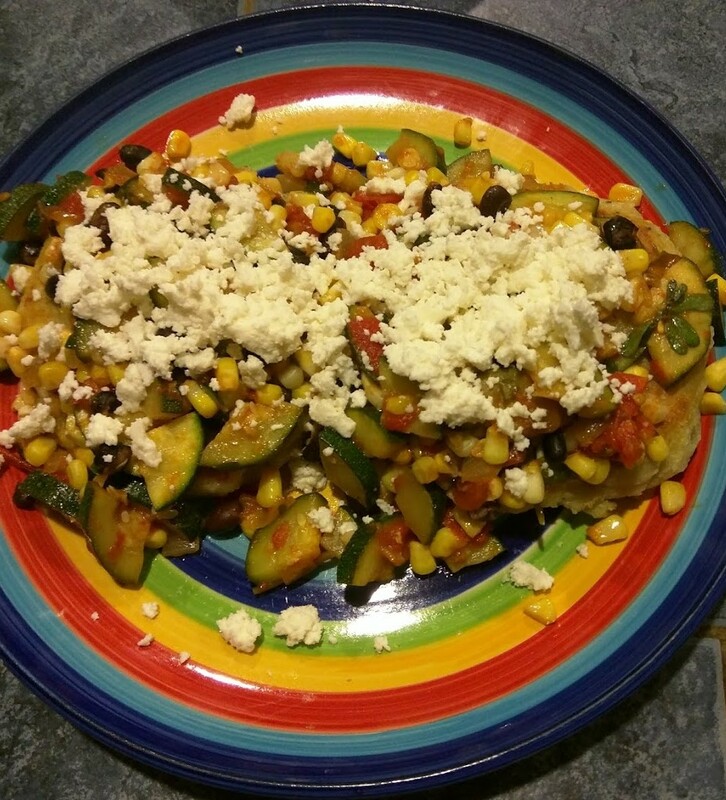 tomato, and onions topped with queso fresco on a masa patty. The tribes understand that this is just the beginning. Many have set up camp for the Winter. The Sioux have been joined by other tribes who have also been exploited for their land and water, including: the Navajo, the Hopi, the San Carlos Apache, and our local Tohono O'odham. It is inspiring to see these tribes uniting for a shared cause and working together to meet the needs of the camp - educating the children, keeping up morale, providing firewood, medical care, spiritual support, and traditional meals. We may not be on the front lines fighting for water, but we can march in solidarity here in Tucson, sign the petition to stop the pipeline, contact our representatives, and try to conserve water. (Here are some other ways we can help.) Like the 3 Sisters, we are stronger when we work together. Sign the petition to stop police in riot gear from arresting the brave journalists covering this historic fight. Contact the banks funding the Dakota Access Pipeline. 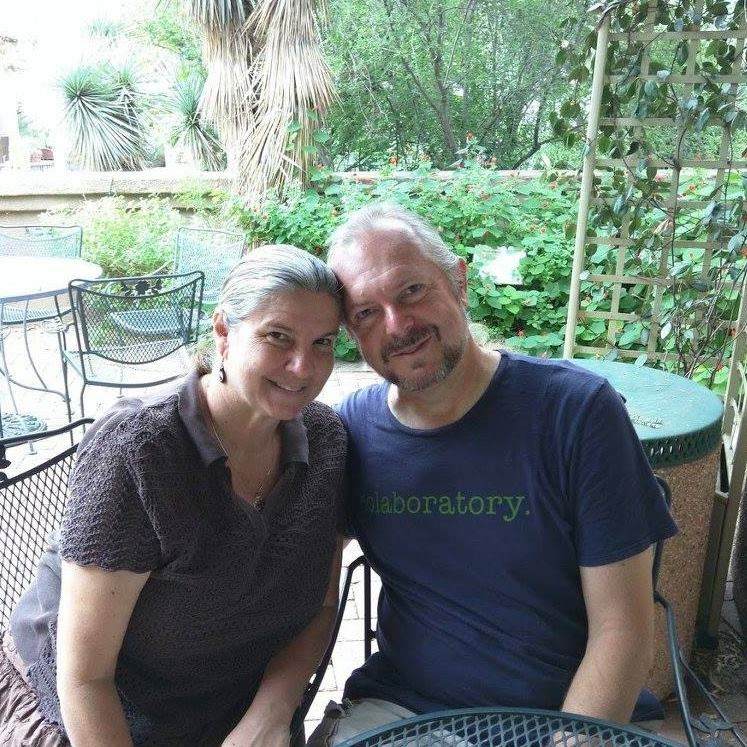 Donate to the Legal Defense Fund.